Google has launched a new service called Google Keep which allows a user to take notes in the form of text, images and audio. The service is closely tied with Google Drive as all your data is stored there. You create a new Note and it gets synced to your Google Drive automatically. You can edit the same note on any device provided you use the same Google account on each of them. 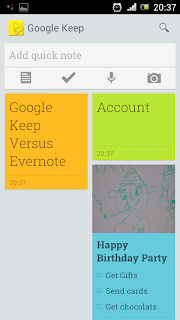 In Google Keep you can add colors to your note. The web interface is available at Google Keep. The Google Keep service is surprisingly simple to use. Google may bundle this app in the next version of Android so it comes installed on newly purchased smartphones. Google Keep does not have a future. Google killed most apps in the productivity segment like Google Bookmarks, Google Notebook and quite recently Google Reader. There is no guarantee that Google will continue this product after a few users. There is also Evernote, which is light years ahead of Google Keep in terms of features. 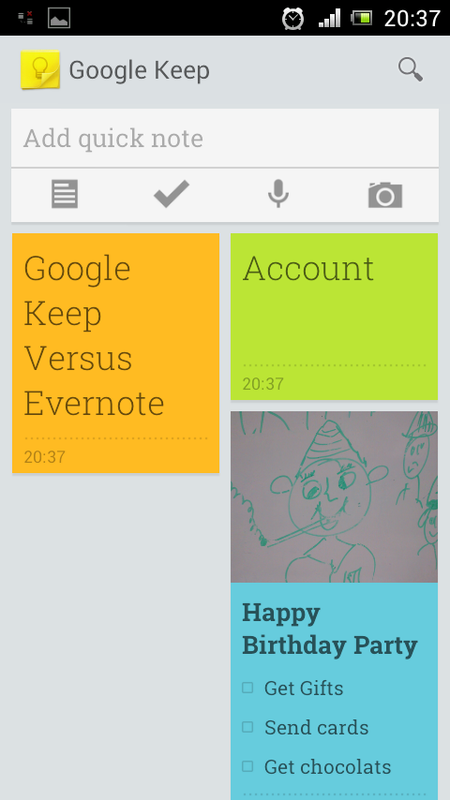 The only plus point Google Keep does not limit the user to 60 MB size every month like Evernote. Disappointed with Google Keep.Pretty useless compared to available applications elsewhere. No future,and very likely Google will kill it.